IN THE SKIN, THE DECREASE in elasticity (recoil) and the decrease in extensibility (stretching) are associated with the increase in the formation of rhytides or skin folds — commonly known as wrinkles. Both occur with age, but these effects can be reversed without surgery by using hyaluronic acid, which improves rhytides and skin condition, while supporting and volumising tissues. 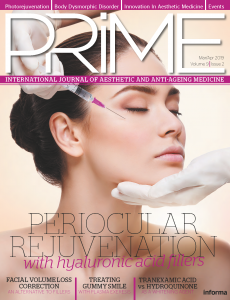 MD Skin Solutions produces Pluryal, which exerts better results in comparison with other hyaluronic acid systems in terms of durability and stability. Recoil and stretching seem to occur when a point of inflection is reached in the mechanical balance in the layers of the skin, obviously resulting from the facial ageing process. We can consider the skin as an elastic fabric that deforms in response to external loads, including compression, tension as well as shearing forces. This condition is added to the condition of bone resorption, ligament stretching and descent of adipose panicles that further complicate the condition, thus leaving the patient helpless before a physiological process. It is true that it is completely natural, yet it can be treated. By understanding the facial ageing process, we understand then that not only does the skin deserve treatment i.e. the therapeutic ones in the reversal of the process must go to each of the immersed layers to counteract the stigmas of the process. 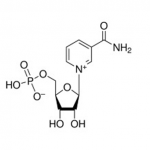 Hyaluronic acid is a product that has received special attention because it plays a decisive role in the hydration of the extracellular space due to its ability to attract water molecules, and it also creates physiological conditions in the extracellular matrix for the proliferation, migration, and organisation of cells. Purified hyaluronic acid products represent a very good option for the correction of the physiological characteristics of the skin, hence improving rhytides, and skin conditions, supporting and volumising tissues. It achieves a high satisfaction rate in patients, through the use of a well-tolerated non-surgical method, with a low risk of complications and local inflammatory reaction rates. Also, it does not require a sensitivity test, has immediate and satisfactory effects, and has a convenient duration. MD Skin Solutions offers a range of products based on hyaluronic acid with a high technology since it not only handles different crosslinks but also has an excellent level of tolerability due to the presence of glycerol, which stabilises the product. This avoids inflammatory reactions after its placement, especially when combined procedures are performed. The study included 30 female patients between 45 and 50 years old, with moderate laxity according to the study conducted by Leal in 2016, without previous procedures, or systemic diseases and with willingness to enter treatment. 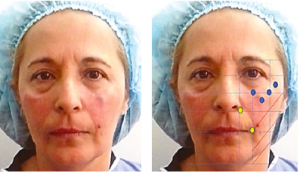 A lifting system was designed based on the placement of three different viscosities of Pluryal in the same session to create periosteal, hypodermic and dermal support, with the three injectables under the bi-vectorial technique applied according to the facial planes and the zero points present. The procedure consists of performing a predictive plot on the facial structure locating the points of greatest tension available on the axes of coordinates detected by the natural planes (Figure 1). The procedure is initiated by stratigraphically placing the deposits of Pluryal Volume at the periosteal level in the zygomatic zone with three coded algorithms of 0.1 ml in each one, three in total of each side, which would add up to 0.6 ml. The 0.4 ml remaining will go 0.1 ml in each cut point below the orbit adding a total of 1 ml. Subsequently, we proceed with Pluryal Classic to vectorise the lower third from the piriform space in elevation, making three vectors on each side in retro-injection and from the nasal wing getting the fixation in the canine fossa with cannulas of 25G/50 mm, four vectors of each side of 0.1 ml, which would total 0.8 ml and two algorithms in the piriform fossa of 0.1 ml each. 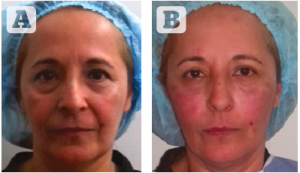 In culmination, we carried out a technique of dermal deconstruction of zone two to zone three facial with Pluryal Booster in vectors in the dermis, in positive planning hence achieving reverse forces of traction according to the Langerhans lines (Figures 2-3). We compared the measurements taken of the vertical dimension through frontal clinical photographs for the patient sitting in the Frankfort plane parallel to the ground and at a distance of 50 cm. 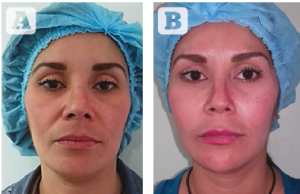 The photographs showed metrically the replacement of 80% of verified facial height in loss and gain in order to verify the changes immediately after, and 1 month after the procedure, the duration of the effect was effective up to 14 months afterwards in 60% of the cases. Regarding patient satisfaction according to the survey, it was 80%, which shows the duration of the material over time and tissue response. 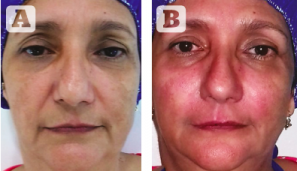 The articles that present results for the facial thirds are varied, which partly dissatisfies the patient. Due to this type of request, Pluryal offers total results if the cases are planned geometrically, guaranteeing the placement of the material in the appropriate planes with vectors directed towards the lifting points. A study presented by Glasgold in 2015 agrees with what was presented in this paper, based on the fact of volumisation with the elimination of facial shadows, to achieve the incidence of light on the face, which guarantees the clarity evidenced by the repositioning of the tissues to their initial sites. When used as a lifting system, Pluryal exerts better results in comparison with other hyaluronic acid systems in terms of durability and stability of the treatment. The combinations of the three injectables are effective over time and the tissues are stable.